At fusionBIM, our focus and expertize is to make the transition to BIM, a risk free path for our clients and show you that it is really as daunting as you thought it to be. That is why we also include this 2 hours tech support in this bundle. Training courses to suit your needs is available on request. You are never alone, help is always very close. 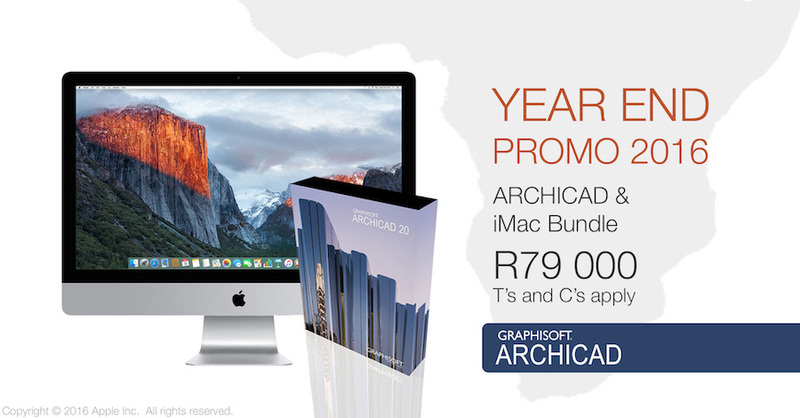 So, new customers can get new licenses of ARCHICAD + a shiny new iMAC 27" + our supportBIM120 package all bundled together. Get answers to all the basics as well as more advanced questions of implimenting BIM in your design practics. Now you can start harnessing the power of the "I" (information) in BIM with the ARCHICAD 20 software ecosystem and included tools. Offer valid while stocks last. Only 25 bundles made available nationally. with license activation via Software Protection Key. Value of bundled hardware cannot be transferred into further discount to client.